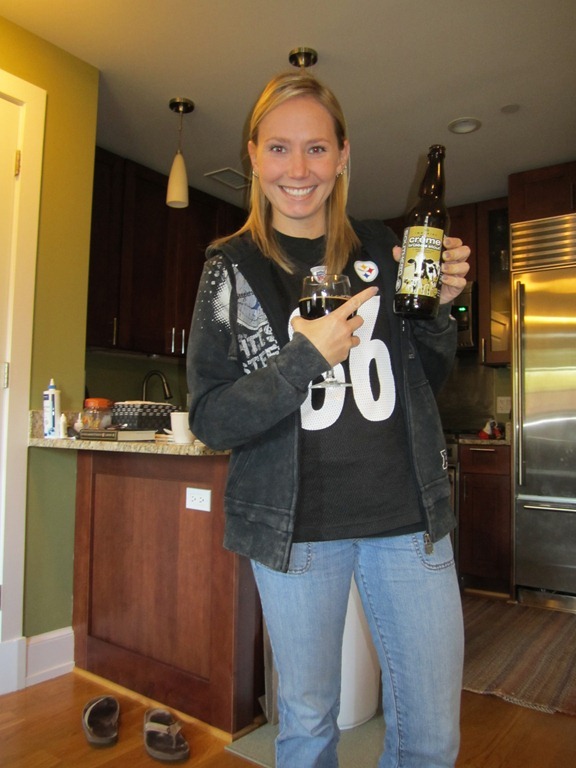 During Sunday’s Steelers vs Patriots game I watched in anticipation and fear and enjoyed a beer that I have been searching for for 6 months! I finally hunted down (after trying multiple places) the Southern Tier Crème Brulee Imperial Milk Stout by Southern Tier Brewery of Lakewood, NY 9.6%abv. Oh my god. So dark. SO SWEET. I’m really glad I split this with two other people because it was quite an overpowering beer! Vanilla, roasted and toasty malts, warm, brown sugar, and most of all butterscotch. Thick mouthfeel, sticky, and intense! I really enjoyed this beer! I’m glad when I was at Total Wine I got 3! hehe! And to make my day the Steelers won!! This entry was posted in Beer and tagged Southern Tier Creme Brulee Stout. Bookmark the permalink.